Technology is playing a game-changing role in the healthcare industry. The digitization of patient information has elevated the understanding level and treatment decisions. But how are the healthcare providers coping with enormous amount of data? The terabytes of patient data would mean a complex scenario in getting the precious insights. And, they would be required to improve the quality of human lives. This is where Big Data Solutions have emerged as the savior for healthcare enterprises. With the entry of Big Data technologies, the healthcare industry is now witnessing an evolution in advanced analytics. It can be a great inspiration to medical practitioners and learn a zeal of decision patterns. When it comes to the patient side, Big Data helps them get tailor-fit treatments. Majority of the patient information is unstructured data, and they are also vast and complex. Healthcare organizations would require specialized methods and tools to leverage these data. Machine learning and predictive learning have been helping healthcare technologists to capture these data and process them effectively. 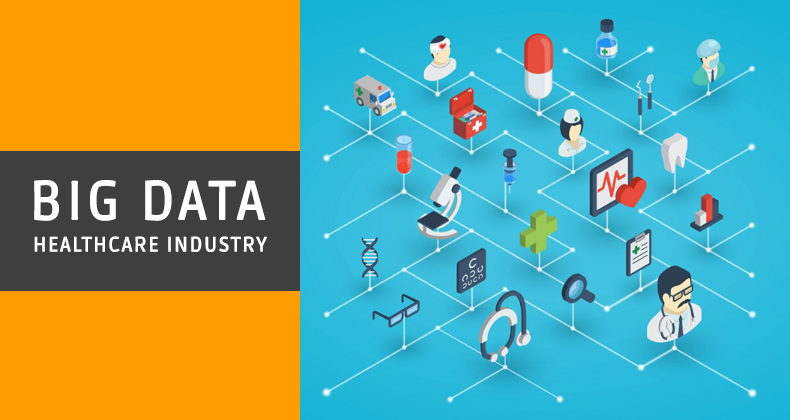 This article gives a brief overview how Big Data moves the healthcare industry in a consumer-friendly manner. Big Data Analytics services plays a vital role in healthcare and pharmaceutical industries by designing simplified health profiles. The predictive models help get a better diagnosis and proceed with faster treatment. Big data technologies are used to collect information about diseases ranging from the DNA to cells and ecosystems. The processed insights aid in driving clinical improvements and enhancing the health conditions of a population. Big Data is a major catalyst in lowering the per-capita cost of healthcare by avoiding over usage of resources. The health insurance companies are now moving from the fee-per-service model to data-driven incentives. This ensures cost-effective and high-quality patient care. Big Data and Analytics can also identify frauds and abuses in the healthcare industry, thereby the reducing the unnecessary healthcare costs. Setting a personalized treatment which is both cost-effective and satisfactory is important. Big Data technologies help to achieve this value-based care. It assists in delivering patient outcomes that is pocket-friendly and transparent in delivery. A popular application of Big Data in healthcare is EHR. The primary goal of EHRs is to organize and maintain the health history of every patient. An EHR consists of a unique digital record including medical history, demographics, laboratory test results, allergy information, etc. These records can be securely shared to multiple healthcare providers. The records are easily modifiable by doctors depending on the patient’s health, avoiding the necessity of paperwork. Integrating both structured and unstructured data from multiple data sources and analyzing them helps to deliver accurate diagnosis. The predictive analytics analyzes the patient conditions and improves the treatment outcomes. It is extremely useful in the case of patients with complex medical histories, when they have multiple medical conditions. Thereby, the clinicians can make data-informed decisions and enhance the medication. Big Data powers healthcare enterprises to store data and analyze historical claims. They can detect anomalies based on machine learning algorithms. This helps in decreasing the fraud costs. The Centers for Medicare and Medicaid Services have stopped healthcare frauds significantly. The association saved more than $210.7 million in a single year using predictive analytics. The predictive models analyze specific claims to identify claim discrepancies and billing patterns. These charges are then compared with a fraud profile before confirming suspicion. Medical practice is shifting towards proactive care by constantly monitoring the patient’s vital signs. And, this is powered by Big Data technologies. Wearable devices with sensors give the opportunity of connecting patients with doctors every moment. This way the doctor is constantly aware of the patient’s condition. The data from various monitors can be processed in real-time using machine learning algorithms. This enables physicians to make effective interventions and take life saving decisions. Patients are now highly interested in their healthcare choices. They have become keen to evaluate services before choosing them. This stresses the need for accurate information to be delivered to the new consumers, so they can make informed decisions. The healthcare industry is moving towards evidence-based medicine. Using all clinical data available and factoring them into clinical and advanced analytics, the industry is improving the patient experience. It will also reduce the per-capita cost of healthcare and improve the overall population health. The ability to capture, integrate, store, and share patient information, provides a comprehensive idea of a patient. This, in turn, engenders better care coordination, improved population health management, and enhanced patient engagement and outreach. The 360-degree view of the patient through Big Data is transforming the healthcare scenario by reducing errors in administering and prescribing drugs, by eliminating redundant and expensive testing, and even avoiding preventable deaths.